Idealized history of settlement in Western New York is told through four "seasons" of progress occuring over 45 years (click image to see entire series). 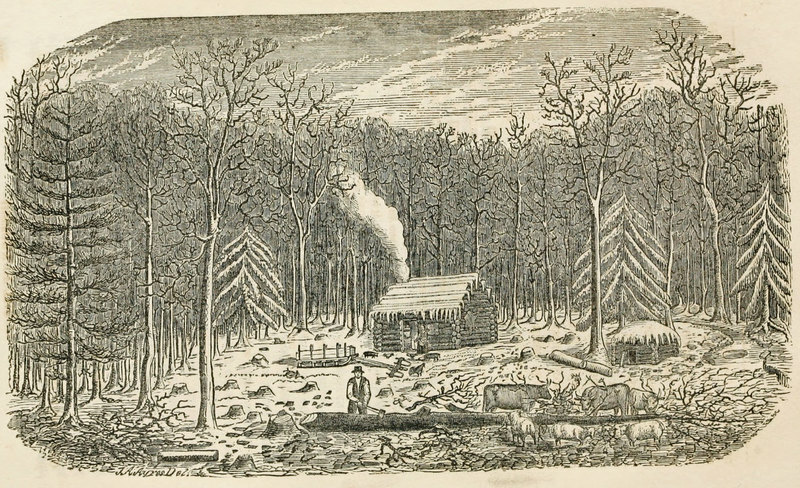 What begins as a nondescript stream amidst "the privations of a wilderness home" (spring) acquires a log bridge in summer, then a framed bridge (fall) and finally a stone arch bridge in the "conversion of Western New York, from a wilderness, to a theatre of wealth, enterprise, and prosperity, such as it is now." It also becomes clear through this history that the area has been deforested--with a corresponding impact upon water quality and fish habitat. During the 1800s, the Genesee River subsidized a valley’s rapid development: it powered mills, provided food and transportation, and watered the surrounding farmlands. By the middle of the 19th century, though, it had become clear that environmental abuses were having an impact on both the health of rivers and the local way of life. In his American Anglers Book, Thad Norris wrote that “In the rivers and brooks of the more settled part of the country, Trout have decreased both in numbers and size. This is to be attributed to many causes; to the clearing up of forests, exposing the surface of the ground to the sun, which has dried up the sources of sylvan brooks, or increased their temperature, and consequently that of the larger waters which they feed, rendering them less suitable for Trout” (202-203). Here we see a vocabulary developing to describe the effects of human actions; Seth Green both interacted with and influenced this emergent conservation movement. Historians have argued that an ethos of utilitarian conservation in early America, which addressed the overuse of “natural resources” through regulations by individual communities, was joined by a preservationist sensibility by midcentury. Transcendentalist figures like Ralph Waldo Emerson and Henry David Thoreau used evocative language to describe natural landscapes; painters like Thomas Cole undertook journeys to picturesque locations that were immortalized on canvas (Chapman). The question of whether nature was to be wisely managed as useful to humanity, or preserved in its own right, continued into the 20th century through advocates like Gifford Pinchot (conservation) and John Muir (preservation). It’s easy to think of Seth Green primarily as a conservationist. His advocacy of pisciculture and “proper management” of streams usually highlighted their benefits to humans: food production, profitability to farmers, recreational angling. “We have tilled the ground four thousand years,” he wrote; “we have just begun to till the water” (9, 7). Nor did he have any qualms about introducing non-native species like the European brown trout. And yet Green’s “scientific” knowledge of fish grew out of such close observation that his perspective sometimes becomes one of admiration, even identification—as when he minutely describes the rituals of trout spawning (Trout Culture 61-64). By the end of his life he was suggesting that fish "possess intelligence and reasoning power" (Home Fishing 28-31). In any event, Green’s familiarity with human avarice and carelessness in depleting streams led to his conclusion that “individual enterprise” with conservation had to be supplemented by government legislation and financial support. New York waterways were a shared inheritance. --Chapman, Ann E. "Nineteenth Century Trends in American Conservation" National Parks Service. U.S. Department of the Interior. Web. 1 May 2015. --Green, Seth. Home Fishing and Home Waters: A Practical Treatise on Fish Culture. New York: O. Judd Co., 1888. --Roosevelt, Robert, and Seth Green. Fish Hatching and Fish Catching. Rochester, NY: Union and Advertiser Co., 1879.